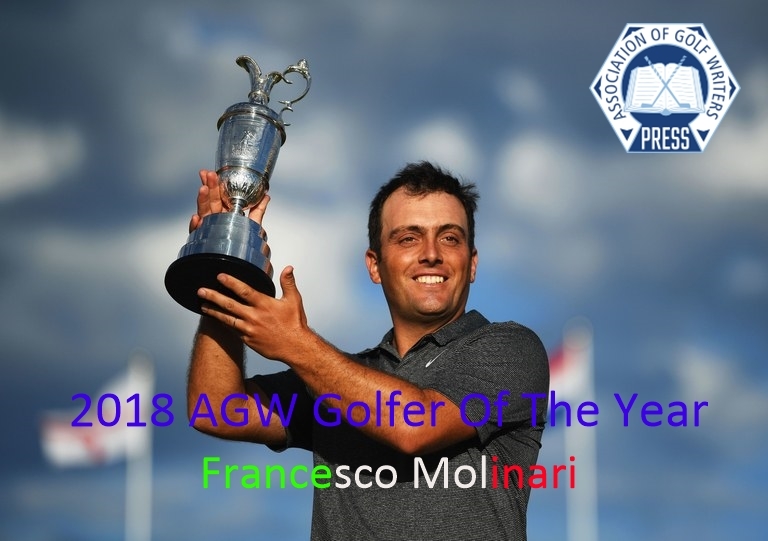 Francesco Molinari – Wins 2018 AGW Golfer Of The Year – First Italian In History Of AGW. Francesco Molinari has become the first Italian to win the prestigious Golf Writers Trophy, the leading award given by the Association of Golf Writers. The 36 year old from Turin was the overwhelming choice in a poll of AGW members after a year of stunning success. Molinari won his first major with victory in the 2018 Open Championship at Carnoustie before becoming the first European player to win all five matches during his team’s Ryder Cup triumph over the United States. Molinari also won the BMW PGA Championship at Wentworth and romped to an eight shot win at the Quicken Loans National in July to secure his first win on the PGA Tour. He comfortably won the European Tour’s season-long Race to Dubai to succeed Ryder Cup partner Tommy Fleetwood as Europe’s number one player. Francesco Molinari becomes the first Italian to win the coveted Association of Golf Writers (AGW) Golf Writers Trophy. “I am very honoured to be the first Italian to be named AGW golfer of the year,” said Molinari. “It has been an incredible year for me and to hear I have received this lovely accolade in what is the 80th anniversary year of the AGW is very special for me. Molinari succeeds 2017 Masters winner Sergio Garcia in receiving the Golf Writers Trophy. Other previous winners include Henrik Stenson (2016) and Rory McIlroy (2014 and 15). “Francesco had the year of his golfing dreams,” said AGW Chairman Iain Carter. “Throughout the summer period he was head and shoulders above the rest in terms of European golf. “His unflappable display at Carnoustie came on a course where he had never previously enjoyed much success. But he completed his first major victory in the company of Tiger Woods, withstanding an emotional charge from the former world number one. Molinari emerged at the top of a leaderboard packed with stellar names including Justin Rose and Rory McIlroy. “Then came a simply stunning display at the Ryder Cup where he formed such a vital partnership with Tommy Fleetwood. Their point in the opening four balls ensured Europe were not whitewashed on the first morning. “It was entirely fitting that it was Frankie who secured the winning point with his singles success over Phil Mickelson. The Golf Writers Trophy is awarded each year to the person or persons, born or resident in Europe who, in the opinion of a majority of the AGW members, shall have made the most outstanding contribution to golf during the preceding twelve months. Members are asked to nominate in order of preference three choices for the award. Other players who figured prominently in the voting included Ricoh Women’s British Open winner Georgia Hall, Justin Rose after his rise to the top of the men’s world rankings and Tommy Fleetwood for winning four matches out of four in his Ryder Cup partnership with Molinari. * The Golf Writers Trophy will be presented to Francesco at the AGWs 2019 annual dinner to be held next July and two days before he commences his defence of this Open Championship crown.